Buttery pastry with plenty of caramelised almonds, softly whipped cream and the lightest of mincemeats combine magnificently in this elegant spin on the mince pie. The pudding can be at least part-prepared in advance: make the mincemeat up to three days ahead, chill and let it come up to room temperature before use. Bake the almond pastry in the morning and allow to cool before layering up with the filling later that day. 1 Mix all the apple mincemeat ingredients in a saucepan and leave to macerate for 30 minutes if time allows (this will draw out the liquid from the apples and deepen the flavours). Cook over a medium-low heat for 10-15 minutes, stirring often, until the mixture is thick and glossy and the apple is just tender; set aside to cool. 2 Preheat the oven to 190˚C, gas mark 5. 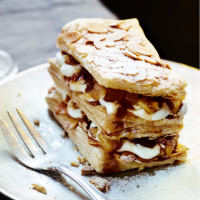 For the millefeuille, mix the flaked almonds, 2 tbsp caster sugar and the egg white in a small bowl and set aside. Lay the pastry on a sheet of baking parchment, dust with icing sugar and gently roll out until slightly thinner (about 0.3cm thick). Trim and neaten the edges, then cut the whole pastry sheet into 18 rectangles (dividing the long side into 6 and the short side into 3). Transfer the whole lot, parchment and all, to a large baking sheet. 3 Spread the flaked almond mixture evenly over the whole surface and bake for 10 minutes. Reduce the oven temperature to 180°C, gas mark 4, and cook for a further 15 minutes; cover the pastry loosely with foil if it browns too quickly. Cut along the gridlines between the rectangles to separate them and set aside to cool completely. 4 Whisk the double cream and remaining 1 tbsp caster sugar until it just holds its shape. Lay out a pastry rectangle on 6 serving plates, almond-side upwards, and spread each with generous spoonfuls of the softly whipped cream. Top with a heaped tbsp of the mincemeat mixture, place a second layer of pastry on top and repeat the cream and mincemeat layers. Finish with a third and final pastry layer and dust lightly with icing sugar to decorate.